Teachers are always on the move to make spelling lessons interesting and engaging. One recent piece of advice is to stop teaching the “i before e except after c” convention because it’s confusing. In short, there are so many exceptions that it isn’t really a rule. While other spelling conventions are useful, this rule has to go. Not everyone agrees with the advice. Some people point out that the phrase does enable teachers to start a discussion about the peculiarities of the English language. But many others think the rule needs to be ditched. 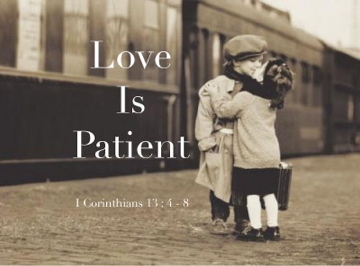 • Love is not envious or boastful or arrogant or rude. • Love does not insist on its own way. • Love is not irritable or resentful. • Love does not rejoice in wrongdoing but rejoices in the truth. • Love bears all things, believes all things, hopes all things, endures all things. Paul’s rules are far more poetic than the sing-songy chant of “i before e except after c,” but clearly, in spelling love, I doesn’t come before anything. When you love someone, U always comes before I.